The Silly Putty impresses with cool tricks and fascinating effects. You can shape it, knead it, pull it, rip it, or let it bounce. An additional feature of the "Glitter" model: It sparkles as if millions of little stars were trapped inside! Available in many fascinating colours that remind of gems or the big ocean. The choice is yours! 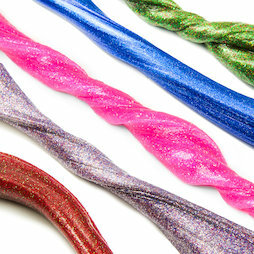 The line-up of glittering putty even contains a special variation for unicorn fans: The pink glitter putty with the dazzling name Unicorn Poop! Also applies to the pink glittering variation "Unicorn Poop": Thinking Putty is unscented. "Saphire" (successor of "Deep Space") fascinates with a very strong dark blue, through which lighter and darker stripes are visible. Also, thanks to countless tiny particles, "Saphire" sparkles as if there were millions of stars captured in the putty. "Ruby" fascinates with a beautiful dark red that sparkles thanks to colourful glitter particles. The incredible colour spectacle of "Galaxy" reminds of pictures of galactic fog as seen on the Hubble space telescope. The base colour is a matt purple. "Pacific" shimmers in countless green-blue facets - just like the Pacific Ocean. At the same time, it features different swirls and structures, which brings out even more different colours.